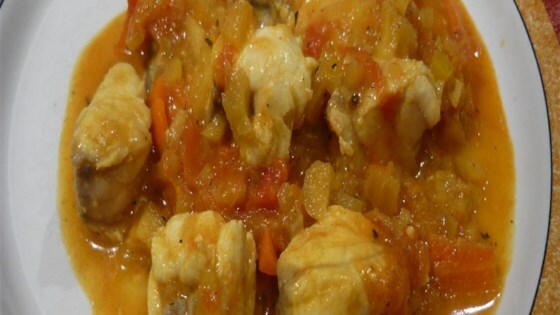 "The tomatoes, carrots, apple, and onion marry with the monkfish, ginger, turmeric, cumin, basil, and cinnamon to deliver a well-balanced and delicate culinary experience. This dish could be served over rice, with mashed potatoes, or with fingerling potatoes. Your guests will be asking for more!" Heat olive oil in a large pot over medium heat. Add onion, carrots, ginger, cumin, curry powder, cinnamon, basil, salt and black pepper. Stir in cooking wine. Reduce heat to low and simmer, covered, until flavors combine, about 10 minutes. Stir tomatoes and apple into the pot. Increase heat to medium-low. Cover and simmer, stirring frequently, until tomatoes soften and break down, about 30 minutes. Lower monkfish gently into the pot; spoon sauce over fish. Cook and stir over low heat until monkfish flakes easily with a fork, about 5 minutes.